Composite lightweight construction based on thermoplastics promises more efficient manufacturing processes and the recycling of obsolete components. Until the innovative materials and processes are used on a large scale some challenges still need to be solved and more experience needs to be gained. 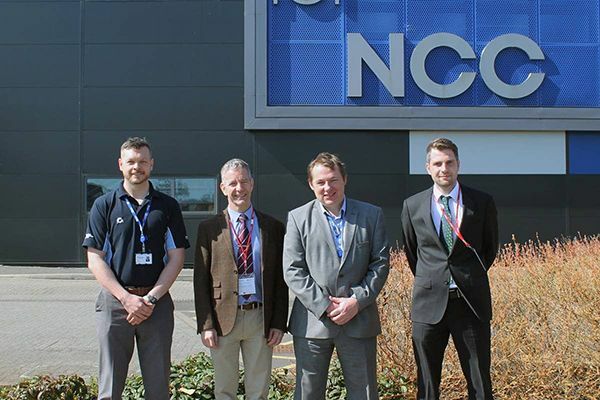 The National Composites Centre (NCC) in Bristol, UK, has set itself both these goals. An integrated manufacturing cell for overmoulding fibre-reinforced semi-finished products from ENGEL is paving the way for mass production in both automotive and aerospace industries. The automotive industry and aircraft construction have traditionally been among the most important industrial sectors in the United Kingdom, where composite research and processing has established itself to an equally high degree. Catapult plays an important role in this. Comparable to the Fraunhofer Society in Germany, Catapult bundles top-level application-oriented research in the United Kingdom and supports the industry to profit more quickly from new technologies. “We act as a kind of catalyst,” says Paul Gallen, Sector Lead Automotive at NCC. The NCC is one of seven institutes which form the Catapult Network, each with its own thematic focus. For many companies in the composites industry, the trend towards thermoplastic materials means they have to deal with completely new processes. It is also the first injection moulding machine for the NCC. ENGEL supplied a duo 1700 large-scale machine including a Kuka articulated arm robot and an integrated infrared oven. “Many of the well-known automotive manufacturers and Tier suppliers have duo machines in their plants, and our partner institutes in the USA and Japan also work with this type of machine,” says Gallen about the crucial point of relying on ENGEL’s technology and knowhow likewise. A second criterion was the flexibility offered by the ENGEL system solutions. The wide range of applications resulting from NCC research projects and company cooperation requires that the manufacturing cell can be adapted to new requirements, new materials and new technologies within a short time. With a clamping force of 17,000 kN, the duo injection moulding machine is suitable for large components. In order to have a practical approach to development, the demonstrator moulds are based on the geometries of real car components. The sample parts have different sizes and complexities. So far, mainly organo sheets have been processed. These are heated in the infrared oven, inserted into the mould by the robot, formed there and then immediately overmoulded with plastic. “The fact that the infrared oven is located above the clamping unit simplifies handling and reduces the cycle time,” reports Gallen. Further developments focus on unidirectional (UD) fibre-reinforced tapes. With the help of these UD tapes, highly stressed areas in the component can be specifically reinforced in order to make even better use of the lightweight construction potential. “Today, the NCC is already a leader in the field of automated fibre laying, so the transition to UD tapes is not too far,” says Gallen. With three differently dimensioned tape layup cells, the NCC is well equipped to produce the layups on site and process them further in an integrated process. The NCC is an integrated factory, all processes can be developed and optimised in the overall context – from material development to simulation, design and processing to recycling. “The interfaces are particularly important when it comes to composites,” explains Sean Cooper, Principle Research Engineer at the NCC. “In no other area are material, design and processing processes so closely intertwined. If you change only one of these three factors, you end up with a completely different result.” It is also important for subsequent recycling to set the course already during product and process development. NCC is working with industrial partners on initial projects to develop value-adding recycling concepts. “The aim, for example, is to give safety-relevant components made of long-fibre-reinforced materials a second life as a bench or instrument panel based on materials reinforced with short fibres,” says Gallen.